In 2001 Ropeadope enlisted the support of John Medeski to produce a recording featuring a then unknown guitar player named Robert Randolph. The Word, went on to spawn a career for Mr. Randolph, while introducing the world to the obscure (yet extremely deep) genre that is Sacred Steel Music - a form of gospel that puts the pedal steel guitar front and center as the instrument of choice. In 2005 ropeadope brings back John Medeski, this time to produce a recording by the Campbell Brothers, the sacred steel group from Rochester, NY known not only for giving Robert his first guitar, but for their living legend in the House of God Church where they spent every Sunday for the past 25 years whipping worshipers into ecstatic frenzy. 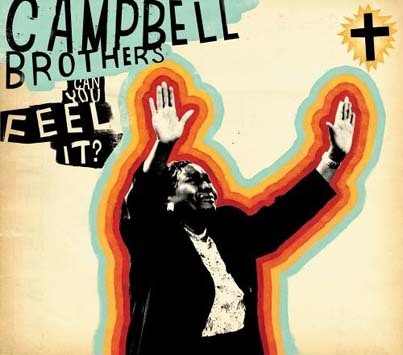 "Can You Feel It" – is a three guitar-gospel-rock assault that bridges the gap between church and state featuring covers (Sam Cooke), vocals (from gospel queen Denise Brown) collaborations (with Medeski) and the divine (amazing grace). It is the tie that binds the blues to gospel and rock to roll.